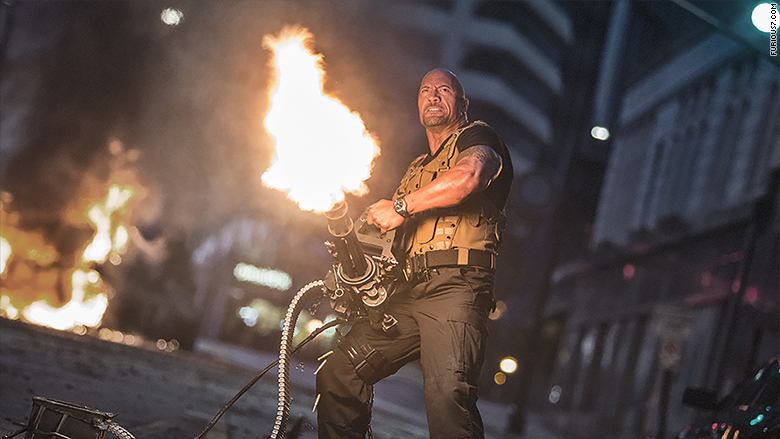 One of Universal's biggest hits in 2015 was April's "Furious 7." Dinosaurs, fast cars, and little yellow minions all helped Universal have a record year at the box office. Universal Pictures announced on Wednesday that in just seven months it has made $5.53 billion at the worldwide box office, an industry record. The new mark eclipsed the previous record holder, 20th Century Fox, which made $5.52 billion in 2014. Universal, which is owned by Comcast (CMCSA), has made $3.59 billion internationally and $1.94 billion domestically thanks to a litany of wide-ranging hits. These include massive billion dollar blockbusters like "Jurassic World" and "Furious 7," family films like Illumination Entertainment's "Minions," and movies that were big with female audiences like "Pitch Perfect 2" and "Fifty Shades of Grey." In mid-July, Universal became the fastest studio in history to reach $5 billion at the box office, and there's still some big films to go for the studio before the year is out. Universal films still to open include the N.W.A biopic "Straight Outta Compton" due to be released in August, "Steve Jobs" which is set for October, and the Tina Fey and Amy Poehler comedy, "Sisters" in December. Domestically, Universal has had five of the top eight openers of the year and five of the top 10 highest-grossing films of 2015. Universal has also been number one at the domestic box office for 11 weekends so far this year.